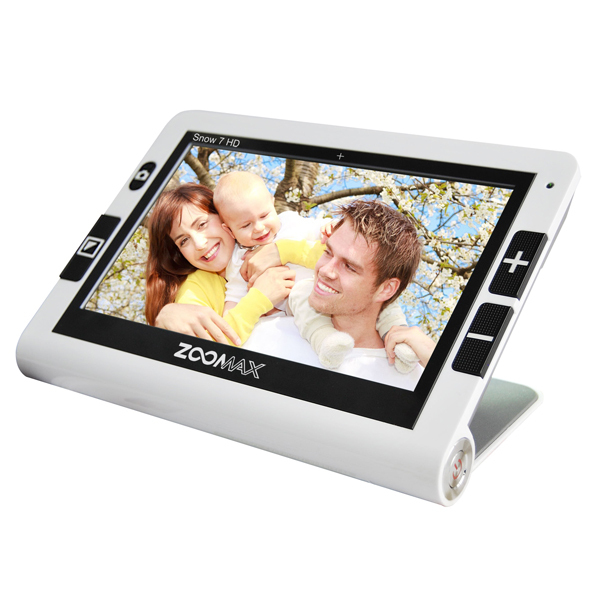 Snow 7 HD Color Portable Video Magnifier - 5 Hours of Battery Use! Inheriting all the advantages of Snow family, Snow 7 HD in a creative design offers the real-time crisp image on the ergonomically settled widescreen, and is still the easiest to use. With its small book size and only 16.93 ounce, it can be taken and used to read anywhere, home, school, office, bus stop, etc. The 5 classic high contrast black and white buttons are functionally intuitive for you to start reading directly. Simple setting and no time-consuming learning are always necessary. The 7’’ widescreen allows you to reach more words and parts of picture on the screen while reading or writing. With screen tilting at an ergonomic viewing angle, Snow 7 HD can satisfy your desire to read more and long time in a comfortable position. Just enjoy your reading time, and don’t worry about neck or eye strain. Also there’s enough space under the camera to work the pen. Because of only 16.93 ounce and small book size, you can use Snow 7 HD to enjoy reading quietly at home, do your homework at school or even go shopping with it in your handbag. It is a good assistant you have. * Intelligently save the last using setting after power off including color mode,magnification, sound, etc. * Warranty: 1 years manufacturer limited warranty.